Christmas is less than a week away and Santa is getting ready to make his way down your chimney. Instead of leaving him some milk and cookies this year, we’ll leave him some of our scrumptious Three Wise Gingerbread Men! 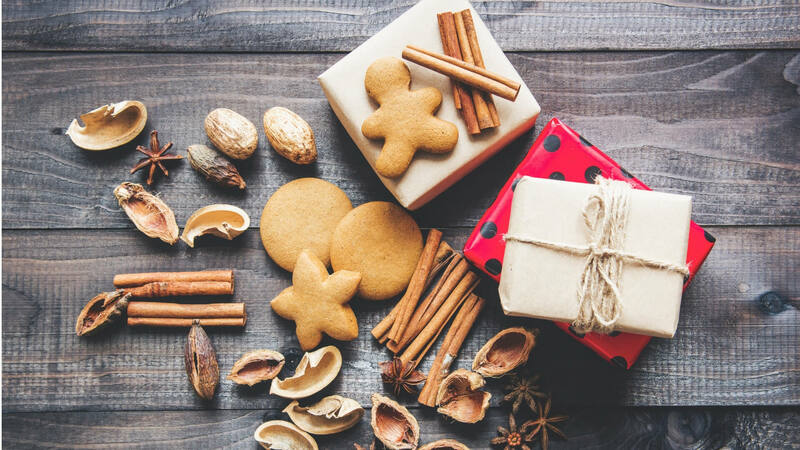 As we explore in this article, the ginger, as well adding a fiery edge to gingerbread, is laden with health benefits. So there’s plenty of reasons to be a ginger nut this Christmas. Ginger, also known as Zingiber officinale Roscoe, belongs to a family of plants known as Zingiberaceae. This family of plants also includes turmeric, another spice thought to have various health benefits (e.g. anti-inflammatory properties). Ginger comes from a perennial plant that has thick, tuberous rhizomes: this means the “thick, tuberous” underground portion of the plant is the stem and is actually the portion of the plant we use. We obtain ginger from the rhizome and process it into various forms. Most commonly, it is made into a powder, syrup, oil or an oleoresin. The most familiar and obvious use of ginger relates to its culinary applications, which date all the way back to the 13th century! It originated from China and eventually spread into India, Southeast Asia, West Africa and various parts of the Caribbean. Ginger has an incredibly diverse range of uses, from dietary supplements, to beverages (ginger ale, ginger beer, ginger tea), and a large amount of food products. Medicinally, it has been used as part of healing practices in Asia, India, Europe and the Middle East. Ginger is often used as an herbal remedy to treat various problems and disorders, such as arthritis, stomach upset, asthma, diabetes and even menstrual irregularities. Ginger holds strong anti-inflammatory effects, most likely due to its high antioxidant capacity. One class of antioxidant found in ginger, known as gingerols, is thought to be of some benefit in inflammatory joint conditions such as osteoarthritis. Some research has suggested use of ginger as an antinociceptive, where it helps to reduce the perception of pain. Ginger is often used as an antiemetic, for dealing with nausea and vomiting. Clinical studies also substantiate ginger's role to combat nausea. Some research suggest that ginger may have beneficial effects on blood pressure, blood glucose and blood lipid levels. In many countries, ginger is utilized for its antimicrobial effects. Some studies suggest that ginger can help to kill some types of bacteria and other microorganisms in the mouth. Current studies are even underway for the use of ginger in cancer therapies. Gentlemen, there are also small studies that suggest that ginger may improve testosterone levels! It is important to note that more human studies are needed to support this fully, as current studies are based on rodents and, of human studies, many have used only a small number of subjects. Ladies… your attention please. Are you, or someone close to you, pregnant and dealing with morning sickness? There is incredibly strong evidence that ginger can be effective for treatment of mild to moderate nausea and vomiting during pregnancy. What does the research suggest? Consuming 1 gram of dried ginger per day (or its equivalent in syrup form) is the recommended dosage for treatment of morning sickness.